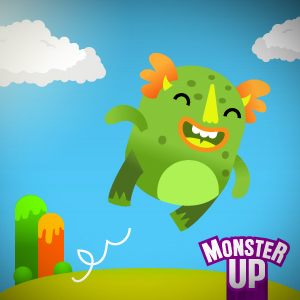 MonsterUp was first released on January 5th, 2011. At the end of the same year, it is still soaring and we thank all MonsterUppers for that! Here is the situation at this time. For the game’s category (action and adventure), in our home Marketplace in Switzlerand, the game is in the top 10 of the Paid apps. 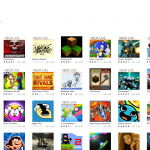 For all the games in the same Marketplace, the game is on the 36th place. 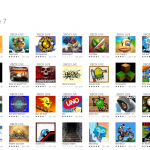 In both cases, MonsterUp has outranked huge XBOX Live games like Gravity Guy, Flight Control, Super Monkey Ball, Pac Man, Bejeweled, Katamari, Earthworm Jim and many many more. The game’s performance in the chards was also more or less consistent throughout the year, so thank you for that. 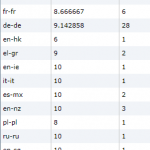 The rankings for the games were also pretty high, from all Marketplaces. The year ends with the average of more than 250 people that ranked the game being more than 9/10. Thank you again for your support! Of course, during the year, MonsterUp was named App of the Month for January 2011 by BestWp7Games.com, it was a finalist in the Top 10 of Microsoft Worldwide Partner Conference in L.A. and we were invited to talk about WP7 games development in 3 universities in Switzerland and Greece as well as a national TV technology show, Escape , in Greece. So all in all, it was a good year. A quick update about the sequel, MonsterUp Adventures. The new game is going to improve and expand in every aspect possible, from Sounasdesign amazing polished graphics, to many new levels and ways to play. Expect all your favorite characters to return and be ready to face ever rising challenges in order to save Trelloland from the evil that wants to take over the happiness of its inhabitants! We can’t say much at the moment, but we will keep you up to date when we can! So happy birthday Windows Phone and all that. It’s been most than one year for Windows Phone and still not many people have it. Recent estimation speak of a 2% market share which is, at least, a pity for such a wonderful mobile OS. Windows Phone has the highest satisfaction rate and lowest return rate out there, does not suffer from fragmentation like Android does, provide variety by allowing many different manufacturers to focus on different aspects (some have bigger screens, some have better speakers, some have better cameras – so there is a choice even though they all run more or less the same OS). In my opinion, it provides the best of all worlds, and for the vast majority of end users, it should be the number one choice. Nokia has come in the game recently, and things look promising, but we will have to wait and see. So what manufacturers sell most phones out there? It’s really hard to tell. We do have some data to share with you today though. During the last year, people playing Galaxium and MonsterUp (all their versions) gave us the following data for their manufacturers. Enjoy. So, first of all, more than 40.000 people played our games (the data above count game runs – not unique devices). Thank you for that;) I wish this meant 40.000 sales for us, but we are giving away Galaxium Free and MonsterUp Lite so these numbers are far far from our sales. Anyway. 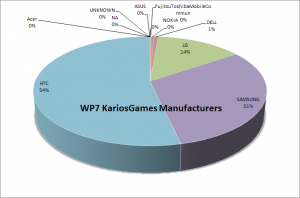 Second, HTC seems to be dominating the WP7 market (assuming players play our games a similar number of times), with almost double the number of the second, which is SAMSUNG. The first 3 phone manufacturers were of course the first ones to release devices to the market, so they have the lead anyway, Nokia is still behind, being brand new and all, even lower than DELL. Update: We are also including another chart for your statistics viewing pleasure. 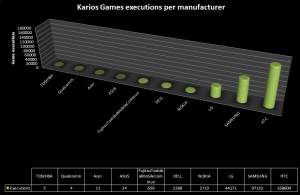 In this chart, we show how many times our games (Galaxium and MonsterUp including their free and paid versions) have been executed in each of the manufacturers. Since the original post, a new manufacturer appeared, Qualcomm. 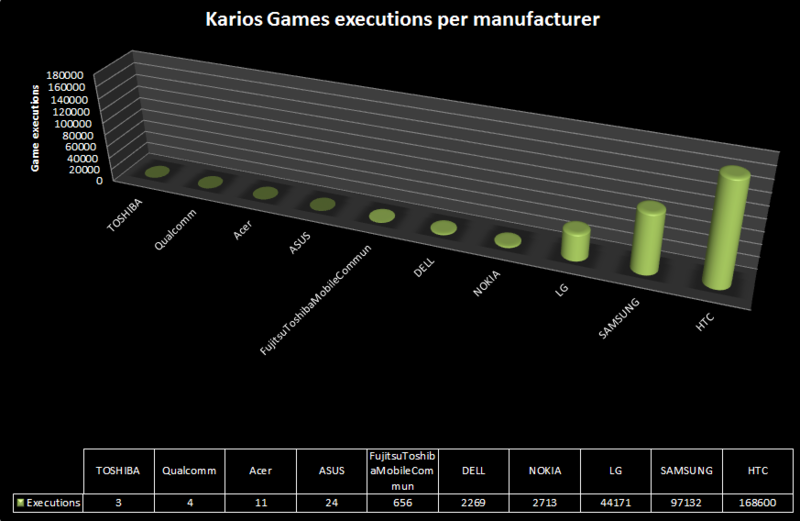 Interesting :) Also, Nokia devices have more than doubled the executions of our games.